Around 1796, Mr. Malthus, an English gentleman, had finished reading a book that confidently predicted human life would continue to grow richer, more comfortable and more secure, and that nothing could stop the march of progress. He discussed this theme with his son, Thomas, and Thomas ardently disagreed with both his father and the book he had been reading, along with the entire idea of unending human progress. Mr. Malthus suggested that he write down his objections so that they could discuss them point-by-point. Not long after, Thomas returned with a rather long essay. His father was so impressed that he urged his son to have it published. 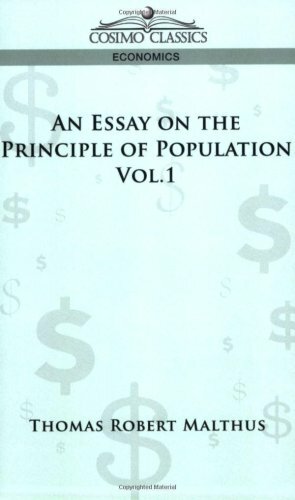 And so, in 1798, appeared An Essay on Population. Though it was attacked at the time and ridiculed for many years afterward, it has remained one of the most influential works in the English language on the general checks and balances of the world's population and its necessary control. Originally two volumes, it is presented here in an omnibus edition. THOMAS ROBERT MALTHUS (1766-1834) was educated at Jesus College in Cambridge. In 1798, he was curate at Albury in Surrey, and became a Professor of History and Political Economy at Haileybury College, 1805.